Party and performance photographers know that Los Angeles offers some of the most fabulous entertainment at its events. But what makes a good performance shot? Professional photographers who have been in business a long time understand that positioning of a subject makes all the difference. When someone is performing on a stage, the lighting behind them can be used to create drama or added interest. Things that might work well in a photograph include a band name, digital displays, or spotlights and colored lights. 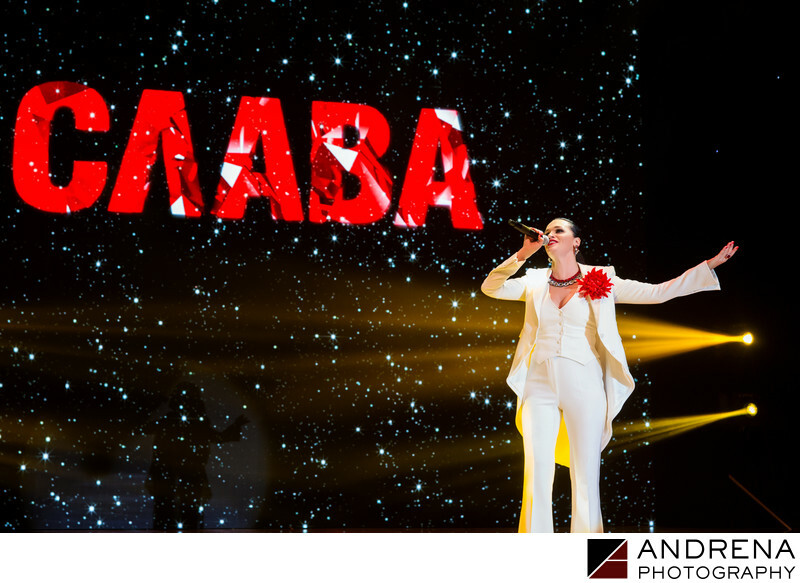 For this image of a Russian performer, we took care to position her in such a way that the yellow spotlights lead the viewer's eye into the subject's body, while taking care to include the digital artist name in the frame. The end result is a composition that has added intrigue and drama, and is more interesting than a photo of a singer in a white pantsuit against a black background. Understanding how to position a subject against background elements is key to great photographic composition.